Municipality demands court rescind Transportation Minister's order to halt construction of pedestrian bridge over Shabbat work. 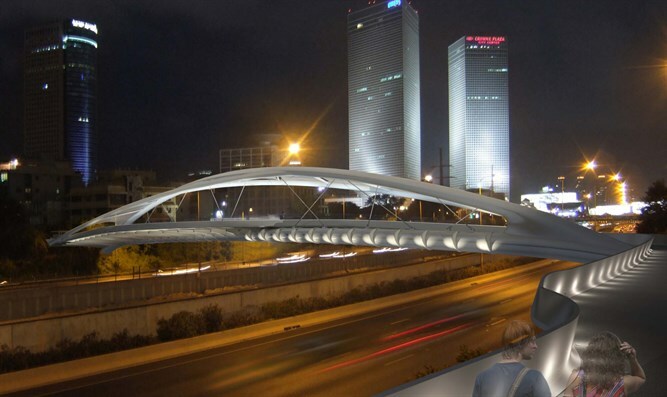 The Tel Aviv Municipality submitted a petition to the Supreme Court Wednesday against Transportation Minister Yisrael Katz and the Netivei Ayalon organization over Katz's decision to delay construction of the Yehudit Bridge because the construction would take place on Shabbat. The municipality's petition to the court includes a request for an interim injunction suspending the decision of the Transportation Minister and to compel Netivey Ayalon to continue work on the pedestrian bridge until the court rules on the petition. The planned construction of the Yehudit Bridge was postponed due to the intervention of the Minister of Transportation, in light of the issue of the Shabbat. Municipality officials claim that the delay in building the bridge is causing heavy damage to the residents of Tel Aviv-Jaffa and the metropolitan area, and therefore the municipality does not intend to wait any longer and decided to turn to the courts. Among the arguments in the petition, the municipality contends that the decision of the Transportation Minister is illegal since the minister is not authorized to give orders to the Netivei Ayalon company and in particular lacks the authority to give instructions regarding work on the Sabbath. This was also determined in the explicit opinion of the legal adviser of the Transportation Minister, which was approved by the Attorney General about a year ago. The establishment of the Yehudit-Bitzaron bridge is part of the Tel Aviv-Jaffa municipality's policy to strengthen the urban fabric between the different parts of the city and to encourage walking and bicycle use in everyday transit. The bridge, designed for pedestrians and cyclists (without motorized transport), will connect the eastern part of the city to the west, will encourage green and safe transportation on foot and by bicycle, will enable residents of Ramat Gan and Givatayim to reach Tel Aviv without a vehicle and help reduce the number of vehicles within the Dan Region - for the benefit of all residents of the metropolitan area," the municipality stated.